Delicious low cost Turkey recipe to impress guests! Important: this is a perfect recipe to serve guests. You prepare most the day before and can then put the pre-made dish in the oven 1-1,5 hours before serving this main course. You can serve with any potato options of your choice but we prefer Krokketjes. 1. Defrost the roll and remove the outer packaging. Leave the net and inside plastic. 3. Heat butter in a large cooking pot and fry the roll with a lid. Roll over from time to time and every time add a little bits of the pear juice out the tin. It needs to say 1 hour in the pot and leave it to rest for a day. 4. When cold, take the rollade out the pot and keep the sauce in the pan. 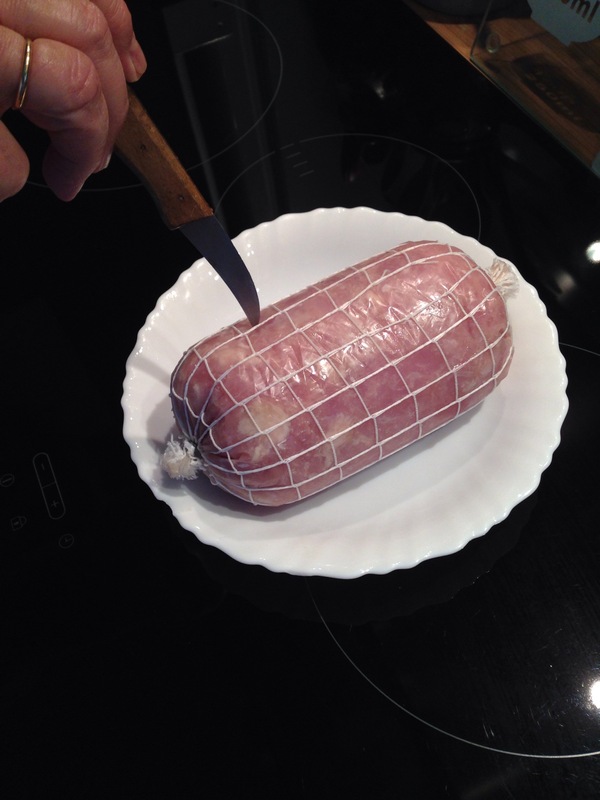 On the chopping board, you remove the net and plastic from the rollade. Cut 6 or 7 thick slices and position them in a glass or metal oven roaster. 5. Chop the round bit of the pears (see picture) and let them leak out, catch all the juice*. The little tips you can add to pot with the left-over sauce from the rollade. 6. Fill the pears with 3/4 of a pack Boursin and position them on top of turkey slices. Cover the dish with tin foil. 1.5 hours before serving your guests you put the dish in the oven heated till 50 degrees. Not hotter as otherwise the Boursin cheese would melt out the pears and the Turkey would become to dry. 7. Add any left over *pear juice and the left-over Boursin cheese to the sauce in which you originally fried the rollade. Heat slowly while stirring continuously, mix it so the pears are chopped and taste. If you used the Boursin cheese with pepper you don’t need to add anything more, if you used the Boursin with fine herbes you may choose to add some pepper. The sauce is then ready, you just need to re-heat it before serving. 8. Roast the almonds in a non-stick pan without any butter or oil. Keep stirring and make sure all are a little brown. Use them later as decoration when serving. Serve either in a larger dish, put the rollade with pears carefully, poor some sauce over the top but not to much. You may choose to offer guests sauce in a separate pot.